NVIDIA today announced the Jetson Nano, an AI computer that makes it possible to create millions of intelligent systems. 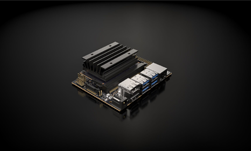 The small but powerful CUDA-X AI computer delivers 472 GFLOPS of compute performance for running modern AI workloads and is highly power -efficient, consuming as little as 5 watts. In the past, companies have been constrained by the challenges of size, power, cost and AI compute density. The Jetson Nano module brings to life a new world of embedded applications, including network video recorders, home robots and intelligent gateways with full analytics capabilities. It’s designed to reduce overall development time and bring products to market faster by reducing the time spent in hardware design, test, and verification of a complex, robust, power-efficient AI system. Availability: The NVIDIA Jetson Nano Developer Kit is available now for $99. The Jetson Nano module is $129 (in quantities of 1,000 or more) and will begin shipping in June. Both will be sold through our main global distributors. Developer kits can also be purchased from maker channels, Seeed Studio and SparkFun.